One Ocean Place, 2 BR 2 BA Luxury Condo, breathtaking views. Sleeps 6. This luxurious 1240 sq. 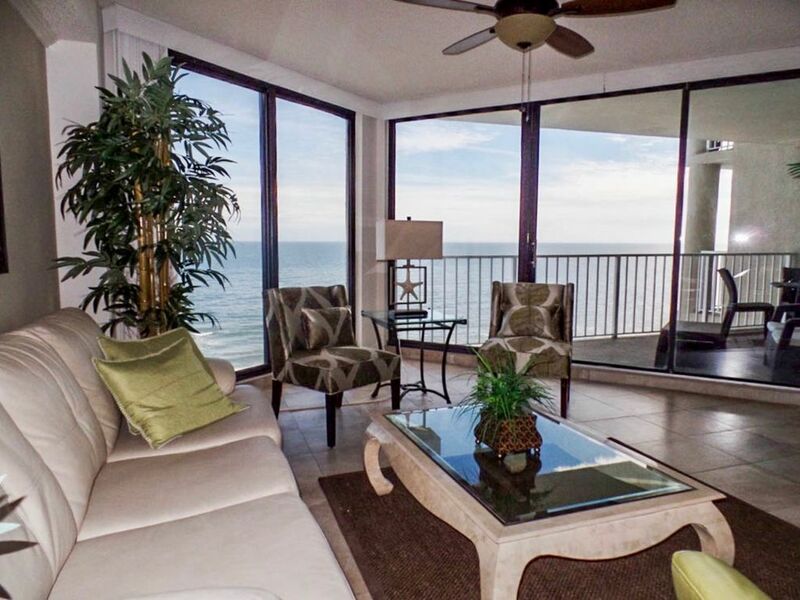 ft. 2-bedroom oceanfront condo is situated on the 6th floor of One Ocean Place . One Ocean Place is Garden City's Premier Luxury Condominium complex located just 15 minutes south of Myrtle Beach. This completely renovated unit offers magnificent views of the beach throughout. The living room is equipped with a queen-size sleeper sofa, wet bar, 60' flat screen Samsung super high definition TV with Samsung sound bar and free in unit WIFI. The room is designed with 5 panels of ceiling to floor sliding glass doors opening to a large oceanfront balcony which is also accessible from the master bedroom. The master bedroom is furnished with a 32'' flat screen TV,VCR, DVD and a new king size bed. The custom decorated master bath is designed with a huge walk-in shower with rain head and walk-in closet with a safe for your valuables. The 2nd bedroom with adjoining custom bath has 2 twin beds and 32' flat screen TV. Kitchen and baths have been renovated with new shaker cabinets and granite counter tops. The kitchen is fully equipped including stainless stove, refrigerator, microwave and dishwasher and there is a in house washer/dryer. Included are two ocean front pools and hot tubs on a raised deck overlooking the beach with plenty of lounge chairs, twenty four hour security and covered parking. Garden City is just 10 minutes south of Myrtle Beach and easily accessible to all of Myrtle Beach's attractions including golf, shopping, dining, amusement parks and shows. Although I grew up in RI, I have lived in this area for over 25 years and would be happy to help you plan your vacation. We take a lot of personal pride in this condo, keeping it up to date and comfortable to provide our guests with a perfect beach experience. Add details about this feature (optional). This building has 2 elevators from the parking garage. This unit is accessible from the North Tower elevator. Clean and modern, with amazing views of the ocean. Quiet and clean, it was the perfect location for us and had everything we were looking for. Easy to book and affordable. This condo is beautiful and the views are wonderful. I loved the newly renovated kitchen and the space is great! The owners are very nice and always available. Great Vacation!! We very much enjoyed our stay. Beautiful condo and amazing views!! Thank you so much for your review Susan. So glad you enjoyed our condo as much as we do! Beautiful condo, great location and owner is great to work with. I very seldom give a five star rating. Conch Café is great spot to eat and is right next door. I certainly appreciate your 5 star review. I enjoyed working with you as well and would hope that if you visit the area again you would contact us. Beautiful condo! Wonderful Hosts! Beautiful view and very clean. Very up to date, beautifully decorated. Tammy, thank you so much for your kind words. It was a pleasure having you as our guest. I will look forward to hearing from you in the future. The condo is beautifully furnished and is definitely " home away from home". The view is amazing. The condo is clean and has a well furnished kitchen The owners with whom you work are VERY nice and so accommodating. Will definitely return!! Thanks Maureen and John for a great vacation! Sharon, thank you so much for your kind words. We enjoyed working with you as well and would welcome your return anytime. Garden City Beach is just 8 miles south of Myrtle Beach SC and 11 miles south of the airport. The area typically attracts families and is often referred to as the 'The Family Beach'. This quaint community offers a local atmosphere and is just minutes from all Myrtle Beach activities including shopping, golf, dinner theaters, variety shows, restaurants, water parks, and miniature golf. Murrells Inlet is our neighbor with some of South Carolina's best seafood restaurants along a picturesque marsh walk as well as deep sea fishing and sightseeing tours. Rates include bed linens, towels and a departure cleaning. There is a mandatory 12% rental tax in all of the Myrtle Beach area. From May through August one week rentals are required with check-in on Saturday and check-out the following Saturday by 11:00 AM. A minimum of 5 night rentals are considered in the Fall and Winter. Monthly Rentals: Available only November, December January, February, and March @ $1600.00/ month.